Kansas City Fashion Week is preparing to conduct its 15th consecutive fashion week. That we are still growing with each passing season is evidence of the re-emerging and vibrant Kansas City fashion industry. Kansas City Public Television has documented our industry's rise to prominence in the 1930's, and decline thereafter, as well as the revitalized marketplace for Kansas City fashion today. KCPT describes "Walk, Turn, Walk" as a "historical and observational documentary about Kansas City’s fashion industry. Through multimedia stories about fashion show producers, designers, models and historians, Kansas City PBS’ “Walk, Turn, Walk” is a comprehensive and thrilling peek behind the scenes of Kansas City’s premier fashion event, Kansas City Fashion Week. We thank you for being a partner with us as we continue to build a viable, sustainable Kansas City fashion industry. Please take a moment to congratulate and welcome our #KCFW F/W ‘19 Designers! Their designs will be shown at The Grand Hall at Power and Light from March 24 - 30 on the Oak Park Mall runway. We will be announcing these designers with more information about them, the day they are showing, and other line up information as the showcases get closer! The Bachelor’s Alex Bordyukov spoke with our Fashion Editor and Model Rebecca Mardikes. Rebecca was provided questions by KCFW participants. He answered ALL of them! Read about them now and get to know all about Alex! KCFW: What did you know about The Bachelor before you went ahead and joined the show? Did you have previous knowledge on the show? Bordyukov: Before the show, I did not know much [about it]. I was interested in the production when they called me and then decided to consider it! KCFW: What was it like to be on The Bachelor? Bordyukov: There is nothing like it. It was different and a very memorable experience. KCFW: Where were you in your life and what were you doing before you decided to go on The Bachelor? Bordyukov: Before the show I was in a good place! I felt established but was seeking a significant other. KCFW: What are you doing now AFTER The Bachelor? Bordyukov: After The Bachelor I travel for work as an IT accountant. Today I will also travel for whenever a fun neat opportunity happens here and there, such as Kansas City Fashion Week! I didn’t want the show to change my life, I wanted it to enhance the life I already created. KCFW: You won “Best Dressed” on The Bachelor! Tell us about your style and where you get your inspiration. Bordyukov: My inspiration is bold styles, colors and patterns. I want a shock factor but nothing too obnoxious. KCFW: How would you describe the perfect date? Bordyukov: My ideal date would be to eat ice cream at the zoo. KCFW: What is your type? Bordyukov: I am a big fan of goofy! KCFW: Do you prefer to pursue or to be pursued? Bordyukov: I personally prefer being pursued, before and after show. KCFW: Who is YOUR celebrity crush? Bordyukov: My celebrity crush is Tiffany Haddish. KCFW: How did you get involved in fashion and runway modeling? Bordyukov: The Brand Ambassador for Kansas City Fashion Week, Edward Manoukian, invited me to participate in the show and the rest is history! KCFW: Who are your favorite designers? Bordyukov: My favorite designer is Mr. Turk. I really like Taft shoes. KCFW: If you were a clothing brand, which one would you identify as? Bordyukov: I would identify as John Varvatos. KCFW: What night are you walking in KCFW and for whom? Bordyukov: I will be walking in Kansas City Fashion Week on Wednesday and for Eddie Bauer. KCFW: Would you rather wear Abercrombie or Sandals with socks? Bordyukov: I would rather wear sandals and socks. KCFW: Omg! Can you ask him out for me? Bordyukov: If I learned from him it would be a regression, I’m self-taught! Haha. KCFW: Have you practiced runway walking before since this is your first time? Bordyukov: My first walk will be Wednesday night. No practice. KCFW (Rebecca): Will you take me on a date? KCFW season S/S ‘19 is proud to present Rachel Roy and her ready-to-wear designs on our runway Saturday, September 29th. Roy recently has received a two-year position as UN Ambassador. Her platform is to empower women. Celebrity clients that Rachel Roy has dressed throughout her career are: Michelle Obama, Diane Sawyer, Kim Kardashian, Kate Hudson, Jennifer Garner, Tyra Banks, Wendy Williams, and Penélope Cruz. KCFW Fashion Editor, Rebecca Mardikes, interviewed Rachel Roy on her label’s belief and how it translates into her fashion designs. Rachel Roy continues to inspire us all in the fashion industry to dedicate our lives to our craft and make an even greater personal impact in our community. We are honored the have Rachel Roy as a featured designer at Kansas City Fashion Week. Kansas City Fashion Week hosted its annual Garden Party on Sunday, September 23rd at a home available from The Koehler Bortnick Team. Thank you to everyone for attending this beautiful event! We had so much fun celebrating the start of our S/S '19 season! We were excited to see so many amazing people from our community attend this event. Let's take a look back into the history of fashion in the heart of the midwest, Kansas City. Kansas City Fashion Week first began in March, 2011. The KCFW team and community is now coming up on its 14th season of bringing creative and innovative fashion into the one of the largest cities in the midwest. Kansas City has a culture that is rich with success in fashion. In the 1940’s, one out of seven women in the city could say they purchased a Kansas City made fashion garment. This step created the platform for the city. Now seeing the industry today, we have noticed some key changes in the fashion community that manifest significant its growth in the city. To date, there are eleven model agencies, more than a dozen fashion magazines, multiple yearly fashion shows, hundreds of highly regarded fashion photographers, makeup artists and fashion designers. The industry has grown immensely. Fashion trends are now even more prominent within Kansas City, but what really excites us is seeing those take fashion into their own hands and manifesting their creativity. We notice this especially at events like First Fridays in the Crossroads, street style attire, and those attending fashion events such as Kansas City Fashion Week. The future for fashion in the midwest? It’s an exciting one. Our team has noticed a trend towards household name fashion designers reaching out to work with major midwest fashion shows. In light of this trend, we are excited to be showing Rachel Roy this upcoming season, s/s ‘19. Georgina Herrera just showed her fourth collection with Kansas City Fashion Week in March 2018. She admires the scale KCFW has grown to and working with the most talented people in the Midwest. As a mom, wife, and grandmother her time away from KCFW is pretty full, but in her moments of free time she works to build her brand further, spend time with her friends, practice yoga, and enjoy life to the fullest. She loves to travel and experience different cultures and learn from them – one of her most exciting moments was swimming with sharks in the middle of the ocean while in Mexico. Her all time favorite movie is Pretty Woman, and she loves appetizers and desserts equally. One of her most valuable lessons as an adult is to never say never because you never know what opportunities life will bring you. Overall, Georgina loves living a full life, meeting people, making mistakes and learning from them, and supporting the people around her. Meghann Wheelock, a Kansas City based designer, showed for the second season with Kansas City Fashion Week October 2017. Her favorite part of KCFW is the people – she loves being in the midst of the incredibly supportive fashion industry of Kansas City and seeing her vision come to life in a larger scale. When she’s not working with KCFW, she enjoys graphic design, reading anything by Tolkien, geeking out over Harry Potter and Star Wars, daydreaming about Disneyland, and playing with her adorable niece. If she could travel anywhere in the world she would jet off to the Netherlands, Tanzania, or Italy to experience her family’s cultural backgrounds. One of the coolest things she’s ever done is travel to Europe for trend shopping, and it made her feel incredibly fancy. You can find Meghann on the #KCFW runway again this season with our upcoming shows in March 2018! The final night of runway shows for the F/W '17 season was a breath of fresh air! Amazing designs, detailed pieces, and impeccable craftsmanship from 8 collections of designs created an unbelievable show! What a way to end the season! This is Michael Drummond's fifth time presenting a collection at KCFW. Michael is known for being a Project Runway veteran (season 8). His client list includes Tika Sumpter and Heidi Klum and his work has been showcased alongside Alexander McQueen, Viktor and Rolf, Maison Martin Margiela, Iris van Herpen and Pam Hogg. Primarily a knitwear designer, Michael finds inspiration from architects, buildings, and bones. As an independent designer, Laura McGrew founded the TOMBOY label in 2003. Since then it has become eminent in Kansas City and conspicuous for quality, sustainable clothing. This reputation is preserved by monitoring the manufacturing process from start to finish. Each piece is cut at her studio in Kansas City. The TOMBOY line of knits is made exclusively from the best quality Rayon Spandex Jersey that is domestically milled from the finest yarns. The F/W '17 TOMBOY collection was a colorful mix of gray, blue, black and lime green fabrics. Dominant styles included jumpsuits, wide legged pants, leggings, turtleneck dresses, and long skirts in some of the most comfortable and soft fabrics imaginable. TOMBOY merged street style inspiration with athletic wear in a chic and fashionable way! Designer Barbara Bultman is inspired by things that are all around her and things that effect the world. She is a Saint Louis based designer and every time she begins a new collection she tries to take in everything that she knows to create something that is innovative and will inspire others. Her F/W collection Voltaic 2017 was inspired by natural energy resources, such as solar panels and wind farms. The looks in this collection featured lots of colorful accents, fringe, and a 70's vibe that was electric to the audience as her pieces walked the runway. Georgina Herrera was raised around jewelry and fashion her entire life. Her family owns a jewelry manufacturing business in Mexico. She began her career as an International Trade Sales Representative for a jeans brand. After starting her family, Herrera began working in the jewelry business under the Mackech label, a prominent Mexico-based jewelry brand. Herrera moved to Kansas City where she again introduced the Mackech brand in the United States. In 2010, she opened her first company, Mackech Jewelry LLC. As business flourished, Herrera opened her first retail store in 2014 in Leawood, KS. Georgina's F/W '17 collection was breathtaking! Large gold and silver pieces with exaggerated shapes and gems. The collection was sophisticated and flawless! Courtney Perry is the lead accessories designer for House of Cochon, a Kansas City based design house. House of Cochon was the winner of The Pitch's "Best of" award 2012, RAW artist of the year 2012, and long time veteran brand participant in Kansas City Fashion Week. This season's collection had a butterfly and nature theme that was inspiring to see come to life on the KCFW runway. Colorful head pieces, large interesting necklaces, and very detailed almost glass-like pieces created a unique and beautiful line! Nataliya Meyer is a Kansas City based designer that is no stranger to the KCFW Runway. She has shown several collections of beautiful evening wear gowns and this season she switched it up by debuting her first ever complete ready to wear collection. Still remaining true to her design aesthetic, she created several dressy looks with lace fabric, wide legged denim, and perfect outerwear pieces as well. ChristianMICHEAL debuted his brand new womenswear line sHe by christianMICHEAL for the first time on the KCFW runway. Taking the incredible tailoring and craftmanship he his know for in his menswear collections and translating it into womens wear might not have been an easy task, but he made it look flawless! Jacket and pant looks paired with cropped tops and perfectly constructed button downs in black and white color blocking patterns created several of the lines dominate looks. Night three of runway shows at the Grand Hall at Power and Light was an amazing collection of show stopping looks from eight featured designers! Los Angeles based Project Runway Alum, Joshua Christensen, debuted a brand new collection for the sold out crowd at Friday night's runway event! The men's and women's looks were a collection of beautiful colors and Asian inspired silhouettes. Always a crowd pleaser, this line did not disappoint! Painted faces, detailed fabrics, and studded plastic jewelry pieces were highlights of the collection. Meghann Wheelock of Ethel and Dean is a Kansas City based fashion designer with 6 years experience working in the Los Angeles Fashion Design Industry. Ethel and Dean, is a children's clothing line that takes traditional kids themes and inspiration and applies them to fashion silhouettes. Meghann's F/W '17 collection featured plaid prints, graphic tees, and military detailing throughout the pieces. The color story of navy blue, army green, and denim, with gold details was a stand out collection! Julia Fischer is a womenswear designer originally from St. Louis, currently based in Kansas City. She designs for women who are serious about fun, demand adventure, and are un-apologetically bold in their sartorial choices. The fabric choices in Julia's collection were amazing! Holographic pieces, denim, bold colors of bright pink and green, and blue velvety-fur were all stand out fabrics that created a collection that was fun and bold! With sixteen years in the fashion industry, Nasheli’s design experience includes working as technical designer, draper, tailor, and fine sewing techniques for different designers based in New York, Italy, Dominican Republic and Puerto Rico. Nasheli's F/W '17 collection was inspired by Catholicism and nuns. She created a Monochromatic palette of structured pieces and amazing silhouettes. Lauren Bander studied Fashion Design/Merchandising at Dominican University and got the amazing opportunity to study in Paris at the Paris American Academy (PAA) under some of the industry's top professionals. She began her own line and now designs women's clothing specializing in dresses for every occasion (casual to couture), while beginning to introduce ready-to-wear separates. Lauren's designs are flirty, whimsical and ethereal. Her signature style is to create pieces using lots of fabric and exaggeration to give extra movement and drape to the look. Long pretty dresses with interesting hems, hooded capes, and pretty feminine pieces walked the runway for her F/W '17 collection. Born and raised in Kansas City, Andrea Long is finishing her first year as a full-time designer. Andrea's first year included completing her fifth and sixth seasons of Kansas City Fashion Week, her second season of the West 18th Street Fashion Show, teaching youth fashion classes at the Kansas City Art Institute, styling for print and clients, teaching sewing to students of all ages and creating custom design work for multiple clients. She is able to draw on her international experience, her background in costume design, and the Kansas City fashion community to create work that connects to the now moments and the dreamy ones. Her Fall/Winter 2017 collection continued the exploration of luxurious velvets and edgy silhouettes. Deep rich colors of navy and green with accents of gold created a stunningly glamorous collection! Embroidered jackets, leather pieces, and plunging neck-lines were dominate details in this beautiful collection. Tiffany Brown is a 29 year old self-taught seamstress. She has been sewing for about a year now and is currently taking classes in the fashion program at JCCC. Her fashion interests tend to be all over the place because she loves different pieces of the fashion world. She is a bit of an old soul, so she pulls towards the older styles and looks because she feels they will never go out of style. Her brand, TRBrown, is a ready-to-wear brand for the individual looking to make a statement at an affordable price. For her F/W '17 collection Tiffany looked towards her love for older styles and created a 70's inspired collection of pieces that were absolutely flawless. Fur pieces, thick tapestry fabrics, wide legged pants, and bell sleeves, all helped to create an unmistakingly 70's glam girl vibe. Jon Fulton Adams has always had a great interest in fashion. He discovered his label's name 'Queen's Rocket' in a Victorian book - it means "the height of fashion" in the language of flowers. He has been designing under that label for over a decade. Jon's degree in Fashion Design comes from the Savannah College of Art and Design, where he also studied costuming and history. His recent work has been on local stages. He has designed for the Unicorn, the Coterie, Heart of America Shakespeare, and several other local theater troupes.Jon's collection of menswear looks were bold and stunning! Dramatic jackets with fur details, bold mixed prints, vests, and even a men's skirt were featured. Thursday night's runway show at Grand Hall at Power Light was a refreshing mix of ready-to-wear, evening wear, and several street style inspired designs! Roger Figueroa is currently a student at Johnson County Community College (JCCC), where he was previously selected as the student of the year by the fashion department. With plans to transfer to the Fashion Institute of Technology in New York City, Roger is utilizing his time to expand his brand in the community and fashion industry. His F/W '17 collection was a new refreshing mix of men's and women's looks! Wiki Wang is a recent winner of the prestigious Pins and Needles Fashion Design Competition in which she competed against the best upcoming designers from across the country! Her innovative looks and styles are effortlessly flattering. Wiki Wang's minimal, clean modern silhouettes have a refined elegance to help women feel more confident in communicating their identity and their personality. Several of Wiki's looks on the runway last night included bell sleeves, flouncy pleated skirts, and details of minimal ruffles. Amanda is a graduate from University of Hawaii at Manoa in Fashion Design and Merchandising, class of 2014. Once she graduated, she moved to Virginia, where she started her own line in May of 2015. Her design philosophy is based on the duality of hard lines and delicate details, sculptural shapes, refined minimalism, a mix of structured feminine silhouettes, and androgynous shapes. The collection Amanda showed last night featured an Asian influence. Very structured pieces of satin, wrap pieces, and detailed belts. Madyssen Hrlevich of Madyssen Jean started sewing towards the end of her junior year of high school and showed her first collection in Omaha Fashion Week a year later. She loves femininity with a darkness, and combining the sophistication of Chanel with the edginess of Alexander McQueen. Madyssen has created the perfect storm of inspiration and her craft is devoted to sharp lines, tailoring, and textile combinations. Madyssen Jean's F/W '17 collection featured a stunning mix of hidden florals, black rich fabrics, and beautiful written embroidery. The dark romantic story that was told through a collection of sophisticated pieces was a crowd favorite. F/W '17 sponsor Lee Jeans showed a sophisticated collection of denim ready-to-wear looks during last night's showcase. Lee introduced new fall fashions with items like jean jackets with embroidery and distressing, jean vests (yes, they are back! ), new girlfriend jeans, and denim with frayed hems, interesting side seams, and tonal patterns. Lee jeans can be found at major retailers including Macy’s, Amazon, Kohl’s, JCPenney, and Lee.com, as well as regional department stores nationwide. Designer, Ciara Fortun, is a 16 year old designer from Omaha, Nebraska. Ciara designs mostly evening and formal wear aimed for the young woman who isn't afraid to convey herself in a unique and sophisticated way. Ciara's F/W '17 collection was full of classic pieces with beautiful black and white details. She is definatley a young and emerging designer to watch! 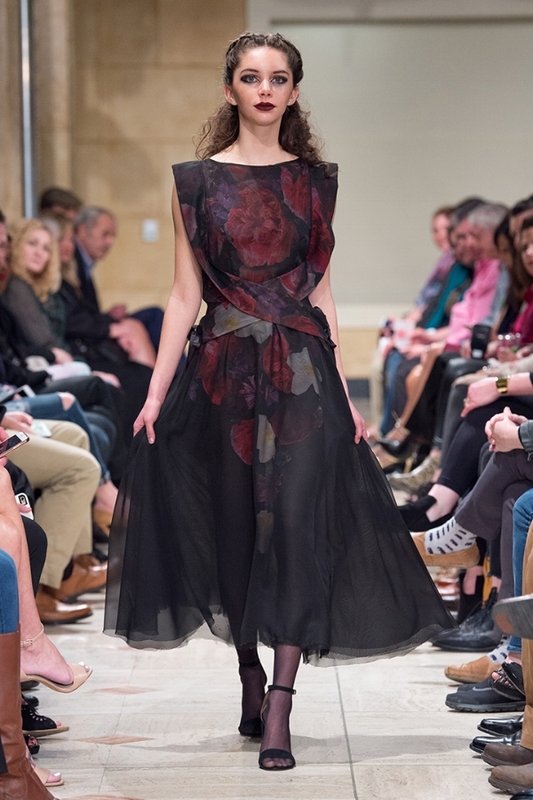 Designer Crystal Brakhage graduated from the University of Nebraska-Lincoln in December of 2016. She loves to make women feel confident, comfortable, and powerful. Her target customer is a women age 20-30 who is not afraid to show who they are and be a little different. This woman doesn't follow the norms because her designs definitely don't. She wants to make a statement. People want to go up and meet her or be her. Last night Crystal debuted a dark and glamorous collection with flashes of gold. The looks were edgy and sophisticated, but still had a street style, cool girl vibe! Eve Emanuel, designer of MTJF, has been at the forefront of creating modest clothing for the modern woman. She aims to provide an option for women to dress in current fashion while maintaining a sense of refined classicism and romanticism in her creations. This season's collection was a collaboration between her clothing designs and Erin Paige's jewelry creations. The inspiration was a street style vibe and also the up-cycle of fabrics and materials. MTJF, short for More Than Just Figleaves, appeals to the modern woman of today who wishes for versatile stylish clothing that is hip refined and classy all in one. Erin Paige Stegman has had a love for the arts and for people. She believes her designs create an opportunity to serve both passions. "I truly believe the individual who wears my design feels this energy transferred to them and will spread it throughout their lives." Erin's F/W '17 collection features a mix of delicate pieces with larger copper pieces. There is an unique mix of hard and soft edges that pair perfectly with Eve's street style designs. Last night we kicked off the first night of runway shows for the F/W '17 season of Kansas City Fashion Week! The venue at the Grand Hall was absolutely stunning! Chandeliers glistened down on the runway as 9 designers showcased their newest collections to a full house of guests and media! High school junior, Miranda Hanson, started sewing at the age of eight years old! With the help of You-Tube, she has taught herself everything show knows about sewing and creating clothing. She became very serious about sewing when she entered high school, after making dresses for several friends and costumes for productions. Miranda's designs for her F/W '17 collection featured details of floral embroidery, bold black and white stripes and blue satin! The show stopping pieces are right on trend and were definatley a fantastic way to start the Wednesday night show! Tobie Roberts began sewing in 5th grade and found her interest in evening wear. She is now a Junior Fashion Design and Product Development major at Stephens College in Columbia, MO. Tobie showcased her pageant brand extension "Oliviet by Tobie Marie" during last night's runway event. "The New Jackies" F/W '17 collection was a showstopper! Pillbox hats, round sunglasses, and retro silhouettes with a modern edge describe several of the looks! Hannah Swanson, designer of Hannah Kristina Designs, is a recent graduate of Iowa State University with a Bachelor's in apparel design. Specializing in bridal and evening wear, she was inspired by waterfalls for her new collection. Several of Hannah's designs featured beautiful drapping fabrics in jeweled tones with silk and sheer details. The finale look shown here featured a delicate shear and sparkle cape look! At just 11 years old, Kelly Callaway is living her dreams of being a fashion designer! She has shown her collections previously at Phoenix Fashion Week and now debuting for the first time in Kansas City! Her looks are vibrant and fun featuring amazing craftsmanship with beautiful colors and patterns. Kelly's vision for bold and modern designs were a crowd favorite, earning her a standing ovation! Cortney Sims and Ilia Siegwald both attended Stephens College and met during one of their art classes freshman year. Later, they started to realize how similar their design styles were and began work on "Coco and Ilia'; a high-end street wear brand inspired by their video game and comic book influences. Their goal is to empower women through clothing that allows them to create themselves and express their individuality. Coco and Ilia's F/W '17 collection was inspired by the boxing ring with a street wear twist! Lace up details, silk robes, and knock out attitude encompassed this fun and vibrant collection! From her early years, Keilah has always been drawn to clothing. During the Fall of 2016, she graduated from JCCC's Apparel Design and Technology program. She possesses big love and admiration for the past, which is clearly exemplified in her creations. She adores clothing, art, and colors that make her feel nostalgic. Keilah's love for vintage was very clear with her F/W '17 collection, which featured bold prints, collared necklines, wide leg flares, and 70' vibes! The retro inspiration was delivered in each look with a nod to a modern girl! Sheraz Pompey is a self taught designer from Kansas City, MO. He started designing in his senior year of high school where he studied fashion design for a half semester which he was taught the basics of sewing. In 2013, Sheraz participated in a local Kansas City fashion show where he debuted his first fashion line which he received great reviews from, and it motivated him to pursue fashion farther. Sheraz's F/W '17 collection of evening looks for men and women featured several show stopping pieces. Glitter, sparkle, and nontraditional silhouettes blazed the runway! Jamesia Manning is an emerging self-taught fashion designer that tailors towards outerwear. Her brand caters to a business professional customer that would like a classic look, but stylish as well. Her F/W '17 collection featured brocade fabrics, tweed, and beautiful tailoring in both men's and women's fashion! Stunning button details, high collars, and rich fabrics made this ready to wear collection complete. This season Kansas City Fashion Week is very excited to welcome Lee Jeans to the KCFW Runway! What better way to celebrate the Kansas City area's rich history in the fashion industry and apparel manufacturing, than with a partnership between #KCFW and local apparel brand, Lee! Originally produced in 1889 in Salina, Kansas and currently headquartered right here in Merriam, KS, Lee has crafted innovative, trend-forward styles that deliver unparalleled fit, design, and comfort through creative fabric solutions and state-of-the-art design technology. For over 125 years, Lee has been purposefully designing clothing to inspire you to live a life in motion. Lee Jeans are associated with many modern denim styles including dungarees, overalls, the introduction of the zipper fly, and the lazy "S" back pocket design. 1. What made Lee decide to get involved with KCFW? Lee is proud to have called Kansas City home for 100 years and as a leading manufacturer of jeans and casual apparel, we are excited to participate in Kansas City Fashion Week and showcase our Fall styles. 2. What does Lee's involvement in KCFW include (swag, runway segment, etc.)? Lee is a Collection Sponsor of KCFW including a runway show featuring our Fall 2017 styles, participation in the Vendor Showcase, and gifting Lee jeans to the Media Event guests / VIP attendees each night of the week. 3. What do you want our readers to know about Lee? Lee is a brand with authentic American denim heritage dating back to the founding of the H.D. Lee Mercantile company in 1889 in Salina, KS. (Lee moved the company’s headquarters to Kansas City in 1917; 100 years ago). Over our 128 year company history, we have been committed to delivering quality craftsmanship and innovation, along with iconic style, in everything we do. We recognize that some people in Kansas City, and in the fashion community at large, have not had Lee as top of mind during the past few years as we would like. We hope to change that with the introduction of innovative products like the Lee Dream Jean, which features a yoga-pant like lining and waistband in a true skinny jean. We are also introducing our Lee Extreme Motion collection for men where we have paired high stretch fabrics with an althetically-inspired waistband to create men’s jeans and pants which easily take him from ‘work to play.’ At KCFW we will also be introducing our new fall fashions with items like jean jackets with embroidery and distressing, jean vests (yes, they are back! ), new girlfriend jeans, and denim with frayed hems, interesting side seams, and tonal patterns. 4. Where can our readers find Lee jeans? 5. What are you looking forward to this year for Lee? We are excited to continue along the journey of brand reinvention which we began in 2016. That journey includes bringing to life our hero products like the Lee Dream Jean and our Lee Extreme Motion platform for men via traditional marketing platforms and also through digital and social. We launched a new marketing campaign last year under the tagline of ‘Move Your Lee’ which was met with rave reviews by the industry and consumers alike. We are happy to be continuing that campaign. We will soon be kicking off an influencer campaign where we are aiming to have many more bloggers and Instagrammers writing about and photographing themselves in their favorite Lee Jeans. We are also working on several efforts to launch Lee products into new distribution – upscale department stores and fashion-focused e-commerce sites. Finally, we hired a new creative director in 2016, and we are thrilled with the photographic style he will introduce in 2017 to showcase the new look of Lee. The Lee brand is an American icon that calls Kansas City home and we could not be more excited to partner together for the F/W '17 Season! See the latest trends from Lee Jeans on the KCFW runway on Thursday, March 30th! Thank you for your support of KCFW, Lee Jeans! Yesterday we kicked off the start of the F/W '17 season of Kansas City Fashion Week with a gorgeous shopping event benefiting the Kansas City Fashion Council at Kendra Scott in Leawood. The store was a buzz with designers, models, media, and fashion lovers all checking out a sneak preview of two looks from designers Tobi Roberts and Jamesia Manning while shopping the newest collection of baubles from Kendra Scott. There was champagn, small bites from North Italia, and sweet treats from Dolce Bakery too! It was the perfect way to start the season! Check out a complete schedule of this week's events Here and grab your tickets before they are gone! Welcome back to Kansas City Fashion Week, CLEAR10 Vodka! CLEAR10 was founded by three Kansas City area guys and is distilled loacally in Olathe, Kansas! It's currently sold in a 4 state region consisting of Kansas, Oklahoma, Missouri and Arkansas. What makes CLEAR10 the best in the Midwest? - Clean water and top quality filtration. CLEAR10 is filtered 10 times, which is where it gets it's name. KCFW is thrilled to have CLEAR10 as the official vodka sponsor at our runway events at The Grand Hall at Power & Light for the F/W '17 season! We are currently working on mixing up some amazing custom cocktails to serve you as you enjoy the excitement of the runway! -- Get Ready! I have always loved fashion and have been surrounded by jewelry my whole life. I grew up around the fashion industry and I have been working in it all my life. I start designing my own jewelry line in 2015, I love what I do and I can’t see my life without it! The slogan of my brand encompasses the brand, my life, and who I am. What I wanted to create was a fusion between my traditions and the world’s fashion trends. The character, strength, and determination of the modern woman. My family began manufacturing gold baby earrings and traditional gold jewelry in my home country of Mexico when I was 4 years old. They later created a high-fashion jewelry company, Mackech Jewelry, which gave me the opportunity to grow up in the fashion industry. I started my career as an international trade sales representative for a major denim company and then as an International Sales representative for Mackech. I helped the brands expand to department stores in Europe and Mexico. Working there I had the opportunity to learn about design, the process to draw and create my renders, manufacturing, and how to sell the final product. I had the opportunity to create my own line of jewelry called, By Georgina Herrera. I love what I do, and the things in this industry you never done. You have to continue to improving and learning every day to be able to grow as a designer. The opportunity to be able to present my new line of jewelry at KCFW. This is a great opportunity to help us learn , grow and get known as a designer brand. I can’t wait for be on the runway this coming season! I’m looking to grow the number of stores that carry my brands. Currently my pieces can be found on my online store, Amazon, Sam’s Club, and local shops like Feng boutique, but I dream of something bigger! I am trying very hard to get in the big stores, I would love to be National and then International with my jewelry line in the most important department stores and I ’m working on that. "The connection between love, art and tradition is unbreakable and determines who we are." Kansas City Fashion Week is raising a glass and welcoming Kansas City Bier Company to our F/W '17 season! Kansas City Bier Company hosted the KCFW committee meeting in February, where we received a behind the scenes tour of the brewery. We learned the ins and outs of the brewing process, the background of their branding, and were even able to sample a few beers. You can try Kansas City Bier Company yourself during our runway shows! Kansas City Bier Company will be providing beer at our bar each night. Kansas City Bier Company Founder, Steve Holle, developed a love of German bier from his father and from his studies abroad as a college German student. Holle’s interest in bier corresponded to the beginning of the craft bier movement in America, which has been largely dominated by English-style ales, and more recently, also Belgian styles. It was Holle’s belief that many craft brewers unfairly dismissed German bier thus, the idea was born to create a brewery specializing in the rich flavor, drinkability, and freshness of locally brewed lagers and ales found in Germany. Holle’s hometown of Kansas City seemed like the perfect place to open the brewery that would produced authentic examples of German styles right here in the Midwest! We are thrilled to have KC Bier Co as a sponsor this season! Coffee and checking social media, Then I drive my kid to school. I was young and could never find interesting clothing at the mall. So once I learned how to use my mom’s sewing machine I started taking apart the clothes in my closet and turning them into new interesting designs that no one else had. This was 1980, perhaps I was one of the first up-cyclers! My clients inspire me: Dedicated community minded women who work hard, love their friends, are kind and uncompromising. I have a BFA in painting from KCAI, and 25 years of experience in the apparel industry. order TOMBOY piece. Maybe that sounds cheesy, but it's true, I love to see people as excited about a well cut top as I am! It's from a quote by Daniel Quinn "You don't keep the circus going to make money, you make money to keep the circus going”.